Former Gov. 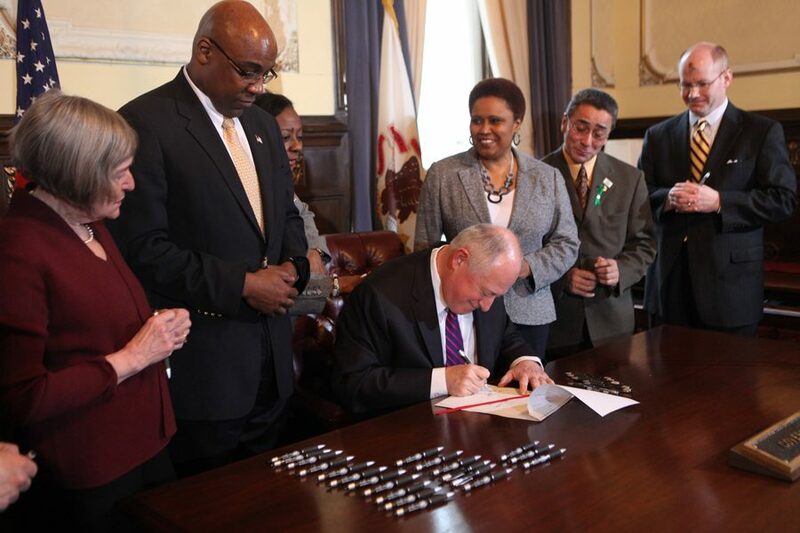 Pat Quinn, center, signs into law a bill ending the death penalty in Illinois in March 2011 at the State Capitol in Springfield with Kwame Raoul beside him. The Chicago Teachers Union endorsed Raoul for attorney general Monday. Chicago Teachers Union announced its support of former state Sen. Kwame Raoul (D-Chicago) for Illinois attorney general in a news release from Raoul’s campaign on Monday. The union represents about 25,000 teachers and educational support personnel working in the Chicago public school system. It decided to support Raoul because he will fight for “fair taxes, adequately and fairly funded schools, the health and safety of Illinois residents, and honest, open, accountable government,” CTU vice president Jesse Sharkey said in the news release. A Chicago resident and the son of Haitian immigrants, Raoul was appointed to fill the 13th Legislative District vacancy left by Barack Obama’s election to the U.S. Senate in 2004. During his tenure in state government, Raoul has “voted to increase education funding, fought for more equity in the State’s school funding formula, and is sponsoring legislation to bring an elected school board to Chicago,” according to the release. The eight Democratic candidates will face off in the March 20 primary. Other candidates include former Gov. Pat Quinn and Highland Park mayor Nancy Rotering. Current Attorney General Lisa Madigan announced she would not seek reelection. “We can count on Kwame to put the people’s business and the people’s needs front and center as Attorney General, something we simply could not expect from some of the other candidates vying for this office,” Sharkey said in the news release.